Antibody Enrichment TopTip micro-spin column enables selective Protein A and Protein G affinity reactions in a convenient micro-spin column. The fine slit at the bottom of the TopTip (slit width: 1-2 µm) permits liquid to pass through (with pressure via centrifuge or syringe), but retains media in the tip. This eliminates need for a filter – reducing dead volume, loss of sample and contamination risk. Protein A and Protein G differ in their ability to bind antibodies of different species and subclasses. Media selection is based on these known affinities. 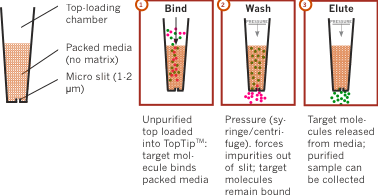 Click the button below to add the Antibody Enrichment TopTip to your wish list.